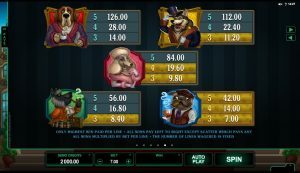 If you cannot resist a pampering party with Man’s best friend , Hound Hotel is the online slot game made for you. 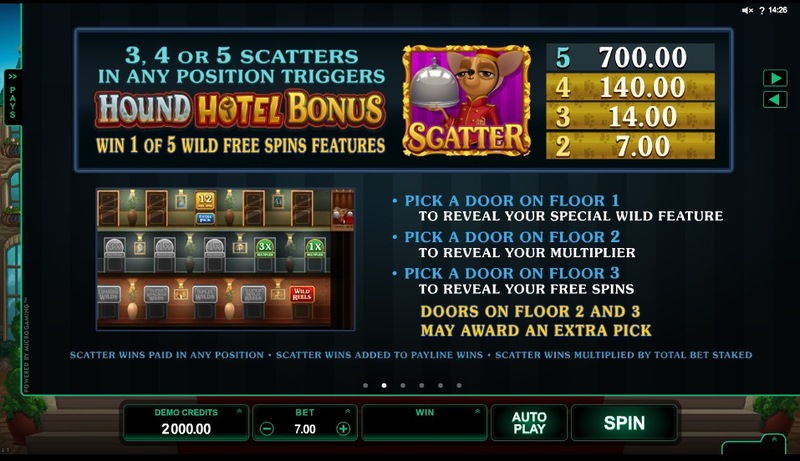 This Microgaming creation has joined the casino arena in June 2015, along with its counterpart for cats lovers named Kitty Cabana. 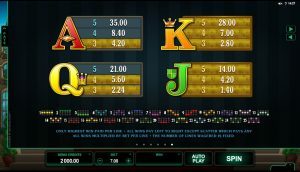 Since then, this 5 x 3 reel game has seen many players fill their paws with one of the 25 paylines prizes. 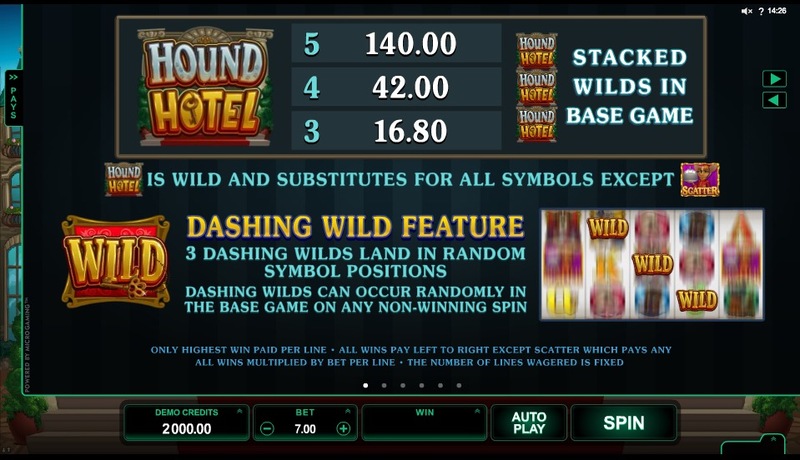 Landing on the Hound Hotel will not confuse you, as the game proposes fairly straightforward yet engaging design. In this dog eat dog world, a bit of simplicity can be welcomed. The screen background displays a luxurious columned mansion, setting an appropriate scene for 5 sophisticated, old fashioned and well maintained canidae to make their appearance. Different breeds such as poodle, bulldog or fox are used for each symbol, the reel being completed with the usual Jacks, Queens, Kings and Aces. Overall the drawings are fine, each species being recognizable and drawn with a sarcastic touch; because we love them doesn’t mean can’t make fun of them a little. 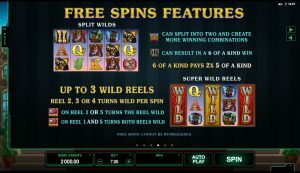 The music that underlines each successful spin is well chosen, with some jazzy music hall melodies matching the game atmosphere. To not let remorses dog you for weeks after playing the game, have a look at the menus before. 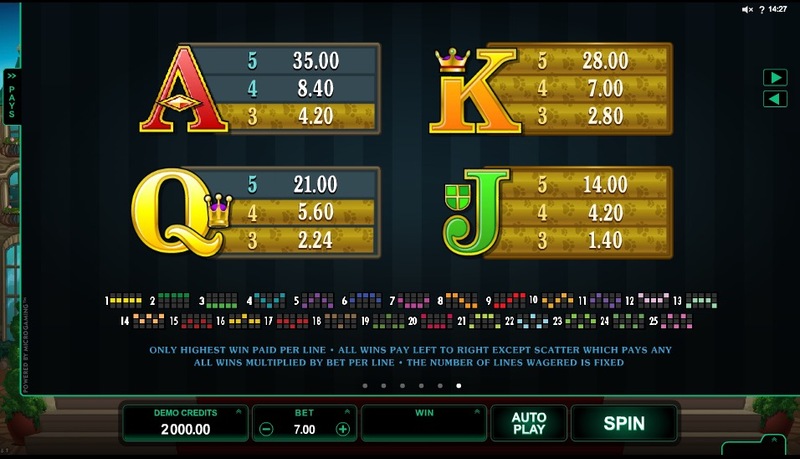 The one at bottom right covers the game settings, help section and stats, while the one called Pays will tell you everything about the financial benefits you can expect from playing this game; and of course they are numerous. The game coin range is £0.25-£37.5 which is quite accessible compared to casino slots average; if you’re used to protest against bet inflation in online gambling you can call your dogs off. Gains with 3 to 5 multiple figures can go up to £675 on the base game dog symbols, £750 for the Hound Hotel symbol (this symbol is also a substitute for other symbols) and £3750 if your land on 5 chiwawa servers, as the scatter symbol. 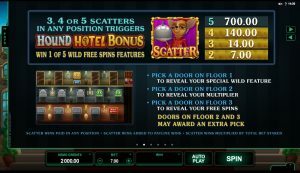 Additionally, 3,4 or 5 scatters found in any position on the reels will launch the Hound Hotel Bonus, there things get meaty. 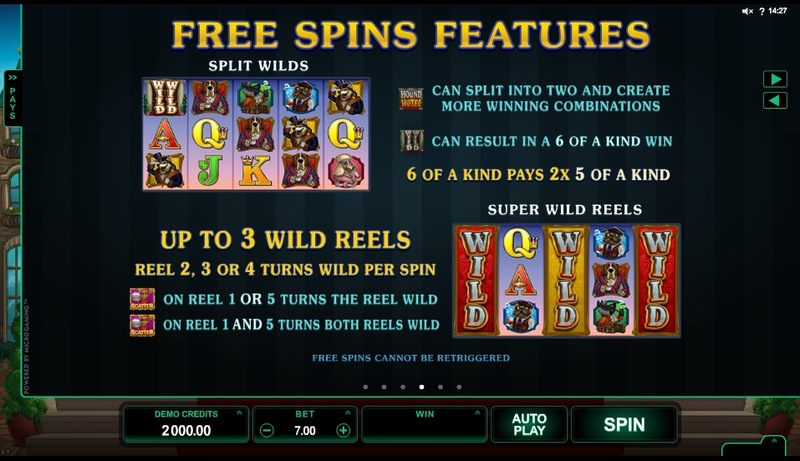 This bonus presents you with doors to pick on free different floors, progressively revealing which Wild feature, multiplier and free spins you will get. If you’re a lucky, these gain features could lead you to chew on a fat £110000 bone; that gives a lot of croquettes to live by. 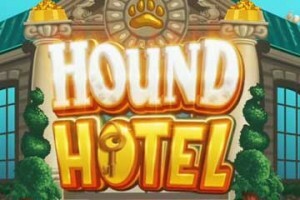 Hound Hotel is an undeniable success in the online slots ranks; proving that going from bets to pets is not a stretch. 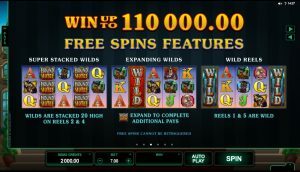 This slots game popular theme is well executed, and its jackpot can for sure leave you wagging your tail. 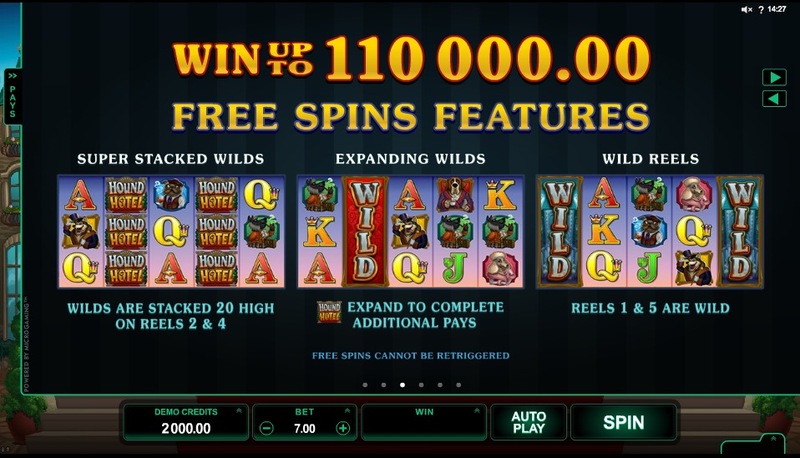 You can try this game for free before unleashing your top dog moves and playing it for real, at one of the many online casinos where it is available – Betvictor, Casino Room, William Hill or CasinoLuck to name a few. It might have you begging for more!